Never let it be said that I didn't love a good wingtip. 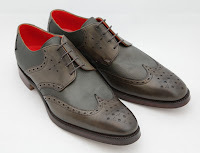 While much of my sensibilities are geared towards modern and forward shoes, the classic and enduring style of a well-executed wingtip can look new and exciting when executed in fresh ways and paired with the right clothing. What stands out to me with this Jeffery West Lemmy 4057 Wingtip in Olive is the definite and attractive subtlety in regards to the color. The gradual change in hues from one shade of olive to the other can allow a gentleman to pull together all of the Fall shades that usually go well with brown with a color that equally says Fall. 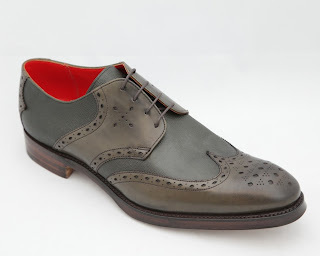 Add to that the sublime construction that Jeffery West offers and this shoe's a winner. Pair this equally with your corduroy cuffed slim leg trousers or with your over-dyed khakis, inky denims or wonderfully patterned Fall suitings and you won't be disappointed. Available now at Jeffery-West.us.